Assembled on Bicycle Stem ,double bolted, fit for most stems. For Bryton Rider series 20 30 210 100 310 330 530 and etc. For CatEye CC series: GL-10 GL-50 PD-100 COM10 PA100 VT210 RD300/310/400/410/430 and etc. For GoPro and GoPro-like action cameras. Compact, lightweight and multifunction with stylish design, easy to carry and use. Aluminum alloy CNC mount bracket with plastic adapter, firm and durable. Can easily installed on bike handlebar stem.3 size install Hexagonal Spanners are included. The mount hole is adjustable, so it can fit most of the stem. 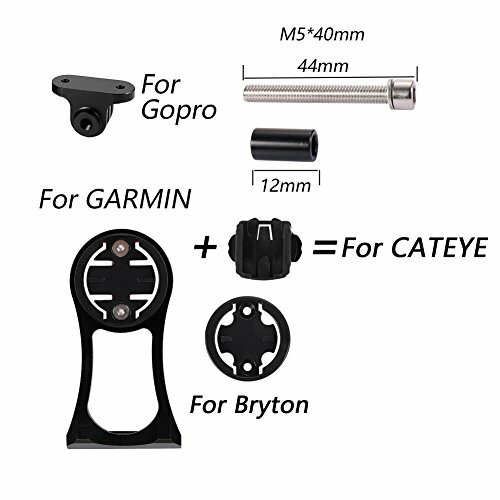 Comes with 4 different adapters, can compitable with Garmin/Cateye/Bryton/GoPro GPS or camera. If you have any questions about this product by Kbrotech, contact us by completing and submitting the form below. If you are looking for a specif part number, please include it with your message.